Austars Model now carries 3 brands of Lipo/Life/A123 batteries for electric flight market. All these batteries use A grade cells, not like some other brands in B/C grade cell with very cheap price. It is impossible for these B/C grade battery to give the users consistent performance. 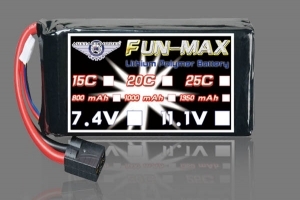 Austars Fun-Max (15C-70C) batteries are suitable for indoor, park flyer, and 250/450 helicopters with the best price on the market.Sypom Sports-Max (20C-120C) batteries are ideall suited for all RC cars, helicopters, and aircrafts at very competitive prices to others on the market.AGA Comp-Max (30C-140C) batteries have been designed to suit your RC cars, Helis, and aircrafts for competition class. Why your battery (Sports-Max and Fun-Max) prices are so low? Is the quality QC compromised? All our batteries are produced by three well known factories. One international manufacturer is the market pioneer leading the technology of advanced energy storage systems such as Li-ion polymer and developed active material treatment technology which can significantly improve the cycle life performance and gassing problem of these batteries, and the other two factories produce and supply the battery for many countries-UAV and satellite systems. These manufacturers are NOT these trading companies in China simply purchasing the cells and labeling their brands. We have found some of the batteries made by these trading companies under few overseas brands left the modelers very bad experience only after some flights due to cell QC issue. These cheap batteries labeled for few big brands cannot be used to power the helicopter for competition level. Our price is reflected by the quantity we ordered. We strive for the quality and we challenge the price!